Casual, contemporary design meets luxury style with the Noah sectional from the Velvetique collection. This American-made piece is perfect for lounging solo or with company thanks to its wide, deep seating supported by heavy gauge sinuous springs. A durable hardwood frame shapes its low-profile track arm silhouette, with every inch hand-tailored in lush velvet. Tufted seat and back cushions add extra flair to this sectional, while a plethora of toss pillows supplies irresistible softness. 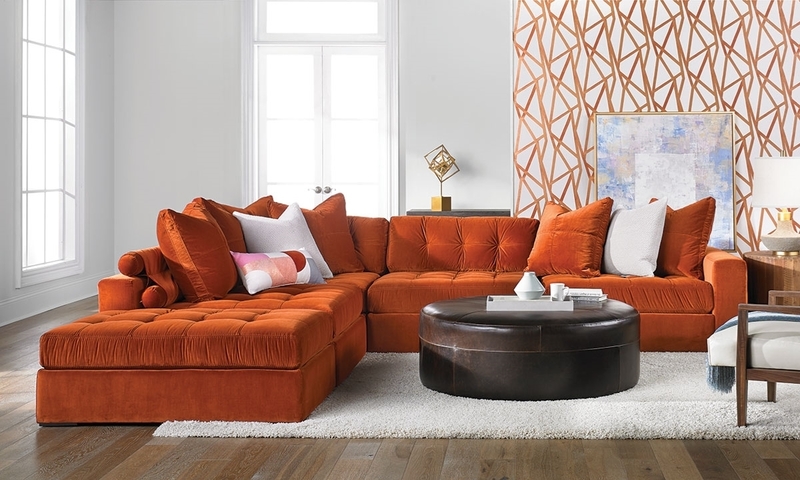 Special order sectional available in a variety of colors, including the rust orange shown here. See store for more details.